In February of 2004 our group of 7 good friends began planning our trip to climb Kilimanjaro in Tanzania, Africa. 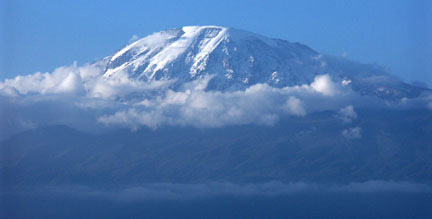 At 19,341 feet, Kilimanjaro is the highest peak on the African continent. It's a mountain of contrasts as the trail begins at 6,000 feet traveling through rainforest as it ascends to the glaciated summit of Kibo, the highest point on the Kilimanjaro volcano. The Kilimanjaro National Park requires climbers to be guided on the mountain so we did some internet research and settled on a highly respected outfitter called Zara Tanzanian Adventures and booked a 6-day, 5-night climb of Kilimanjaro via Machame Route. We purchased our airline tickets through a local travel agency to fly from Albuquerque to Kilimanjaro International Airport on Northwest/KLM airlines passing through Amsterdam, Netherlands. The Machame route is not the standard route on Kilimanjaro but has the largest ratio of success at it ascends the mountain more slowly than other routes and allows hikers to see a great deal more of the mountain as the route traverses the entire south side of the mountain. Going on a guided climb felt odd for me as I've never enlisted the services of a guide and tend to insist on self reliance in the out of doors but I really enjoyed the company of our guide and porters on Kilimanjaro. Traveling to Africa from the United States is an exhausting endeavor. We departed Albuquerque at 8:30am on Saturday, September 4th. After flying through Minneapolis and Amsterdam (enduring some long layovers in the process), we arrived in Tanzania at 8:40pm on Sunday, September 5th. Zara's shuttle was at the airport to pick us up and transport us to the Springlands Hotel (a hotel partnered with Zara) in Moshi, Tanzania. This hotel was very luxurious by African standards and we enjoyed a rest-day in Moshi on Monday to shake off the jet lag a bit (there's a 9-hour time difference between the US and East Africa) before beginning our climb on Tuesday. We met our guide, Juma, and were briefed on the route. Because we were a group of seven, we were our own group on the mountain which worked out very well. Tuesday, September 7th, Machame Gate (6,300ft) to Machame Camp (10,200ft). Awoke at 6:15am after some good sleep. I did wake up at 3:00am feeling very awake due to the schedule but was able to go back to sleep. Breakfast was an omelette, fruit and toast with chai tea and juice at the hotel. We packed three bags-one for the porters to carry, one for the hotel storage and our day packs for the mountain. We filled the bus by 8:30am and began driving with a couple of stopes in town for supplies and to pick up some of our porters. We stopped in town at a market for last bits of food or supplies. The bus was jam-packed with other climbers heading for the same route. The drive was about 50 minutes from Moshi to the Machame Gate. At the gate we were welcomed by ordered mayhem! Lines of men hoping to get on the climb as porters, bags everywhere and us tourist climbers standing around not knowing what to do. We signed in individually with the park service and Zara took care of the permit payments. We had a box lunch consisting of fried chicken, butter sandwich, orange, a muffin and some peanuts. The hike through the foggy but dry rainforest was amazing. The vegetation was so thick, lush and green no one would dare leave the trail fearing they would not find their way back! The trail was in great shape as it had been re-worked in recent years with water bars and steps added where appropriate. We moved "pole, pole" (slowly, slowly) and climbed 3,830 feet in 4 hours, 40 minutes. The pace was slow and ironically tough in that I could not get into a normal hiking rhythm at that pace. All day we were passed by porters shouldering huge loads often times carrying the bulk of their load on their heads. By the time we reached Machame camp, our tents were pitched, hot water for afternoon tea was boiled and popcorn was served. What a weird feeling it was to arrive at the campsite and have absolutely no chores to do! We walked around the camp to survey the scene. Machame camp is in the "short tree" zone and quite dusty. Later that evening dinner was served in the mess tent. Dinner consisted of bread and veggie soup for starters, beef, fried potatoes, cabbage, veggie stew and bananas for dessert. At bedtime the temperature was 37 degrees F.
Wednesday, September 8th, Machame Camp to Shira Camp (12,600 feet). Our tent the previous night was pitched a fairly severe angle but sleeping wasn't too difficult. We awoke at 6:20am to a frosty tent. It clearly had froze overnight which surprised me a bit as I didn't expect the freezing temperatures at that altitude. We had papaya, porridge, bread, eggs, sausage and tea for breakfast. Tasty. I'm was beginning to like this guided stuff. =) We departed camp at 8:35am-five minutes late. Thanks Rob. We arrived at Shira camp around noon. 3:36 hours up. Our guide Juma told us he could tell we were a strong group so we hiked quickly to camp so we'd have more time to acclimatize at 12,600 feet that afternoon. Shira camp was quite dry and dusty as well but we had a flat tent site so I was happy. The hiking that day was enjoyable as we broke above treeline on a rocky ridge with great views of the summit. A recent snow up high had deposited a few inches of new snow making the mountain look a bit more imposing. The clouds rolled in on us during our hike around 11am obscuring our view and cooling the air temperature. The hustle and bustle of Shira camp was interesting to watch and listen to. Lots of activity and Swahili chatter leaving me again feeling guilty for not doing a damn thing to help with camp chores. Lunch of fried potatoes with fresh veggies was served. We spent the afternoon exploring the area around the camp finding numerous small caves in the neighboring rock outcroppings. Dinner again consisted of bread and soup as a starter, some noodles with veggie sauce or beef sauce and a few other tasty morsels. Thursday, September 9th, Shira Camp to Lava Tower (15,200ft) and down to Barranco Camp (12,700ft). We awoke to a temperature of 28F degrees at 6:30am and a heavy frost on the inside and outside of the tents as well as frost caking the grass and rock all around the camp. The day's hike was a great acclimatization hike taking us up from 12,600 to 15,200 and back down to 12,700 while traversing the south side of the mountain. For four of the seven in our group every step above 14,433 feet (Mount Elbert's summit elevation) was a new personal altitude record. Everyone seemed to do very well for the short stint above 14,500 feet and we made good time arriving at Barranco camp 5:15 hours after leaving Shira camp. The trail was well marked and traveled the entire way. Porters hiking towards Barranco Camp around 14,000 feet. Clouds rolled in around 10am and again chilled the air temperature a bit. We rested around 14,000 feet and my pulse was 69 bpm which I was quite happy with. Our route took us past the Lava Tower at 15,200 feet. Juma took Bill, Dan, Erik, Rob and I to the summit of the Lava Tower via an enjoyable third-class scramble. From the Lava Tower we descended to the Barranco camp. The descent through a small valley was awesome. Giant Groundsel trees, lots of green vegetation and running streams offered a change from the barren volcanic scenery we had been hiking through. A light rain/mist came into Barranco camp after we had arrived while we ate a hot lunch in the mess tent. Lunch consisted of fried bread with honey, friend bananas and more fresh cut veggies. Napping and reading in the tents consumed the afternoon. We pumped our own water at the stream that passes through Barranco camp as we weren't too sure about the water that was given to us by the porters that morning. Juma said it was boiled the night before but we watched the porters pour water from the same holding containers they use to carry water from the stream/springs. We used our iodine tablets to treat the water they gave us to be sure. Dinner that night was noodles with veggie sauce, cabbage and spicy cooked beef. Orange slices washed it all down and we hit the sack around 9pm. The summit at sunset viewed from Barranco Camp. Friday, September 10th, Barranco Camp to Barafu Camp (15,270 feet). We departed Barranco camp at 8:35am and arrived at Barafu camp at 2:15pm. The hiking was a lot of fun that day with stunning views of the summit and summit glaciers and an awesome view of neighboring Mount Meru to the southwest. We passed through a couple of valleys along the ascent which added some vertical gain to our total as we ascended, descended and again ascended. One valley was the Karanga Valley-the last place to get water before camp. We filtered more water there to get a surplus for our summit attempt that night, leaving at midnight. The Barafu camp is more shale rock than dirt. But Barafu camp is also very dirty and trashy. Sad deal but expected as this mountain is very popular and crowded. At camp we snacked on popcorn and cookies with tea in the afternoon. I talked with Juma about a side-trip to the Ruesch Ash pit in the summit crater on summit day if we felt up for it. Juma said no problem so long as we paid an extra $50 once we got off the mountain as the ash pit hike is a "separate job." A small price to pay for some added time in the summit crater and getting to peer down into the ash pit. We went to bed around 6:30pm that evening so we could awake at 11:00pm to begin our summit attempt at midnight. Sunset at the Barafu Camp well above the cloud deck. Saturday, September 11th, Barafu Camp to Uhuru Peak (19,341ft) and down to Mweka Hut (10,200ft). A big day by anyone's standards, we would ascend 4,100 feet and descend 9,100 feet. This day really started at 11:00pm on Sept. 10th when we awoke, got dressed for the summit bid, had tea and cookies and departed for the summit a little after midnight. I hardly slept all between 6:30pm and 11pm that night. Once hiking, we stayed as a group the entire time. The hiking pace was fairly slow to start with and got slower as we got higher on the mountain. It was just too difficult to move quickly at 17,000 feet at 3:00am! The temperature was close to 20F degrees and the stiff wind made things feel much cooler. Everyone was wearing all their clothes including down jackets by the time we reach 17,500 feet. We reach Point Stella around 5:30am after slowly grinding up the steep scree/dirt trail for hours. At Point Stella we regrouped our strength and pushed to the summit, Uhuru Peak by 6:02am. The going was easier between Point Stella and the summit as the angle of the trail backed off considerably. Allison was taking it extra slow but pushed hard through two small puke sessions to make the summit. We arrived on the summit in time to witness the sunrise which was truly awesome! The summit scene was true mayhem with rushed photos being taken so that others could descend in a timely fashion. (Not everyone was enjoying the altitude like I was!) We caught a glimpse of Kilimanjaro's shadow cast on the clouds next to Mount Meru. Just awesome! Bill, Erik and I were all feeling very good and opted to hike with Juma through the summit crater over to the ash pit. Getting over there took 45 minutes and was well worth the additional cost. It was amazing to walk through the summit crater next to 80 foot glacier walls. The ash pit itself was a great sight! It looked to be a nearly perfect circle with actively venting fumaroles spewing smelly steam. From the ash pit we hiked back over to Point Stella and descended very quickly-one hour back to camp-on the loose scree trail. Back at camp I tried to nap for a short bit but I couldn't. I was too pumped up from the successful climb of the mountain. I was fully stoked that all seven of us were able to reach the summit together! We packed up and left camp at 12:30pm and it took us 2:30 hours to descend to the Mweka hut. We descended in a refreshing mist. The Mweka hut park personnel were selling Coca-Cola, beer and water so we indulged a bit. Sunday, September 12th, Mweka Camp to Moshi. Man, I slept like a rock last night! Went to bed around 8:30pm and awoke at 6:45am in the exact same position I fell asleep in. Awesome sleep! We began the hike out around 8:15am and arrived at the Mweka park gate around 11:30am. We all signed out and had to complete a form stating whether we summitted or not and at what time if we did. This information was then transcribed onto summit certificates for each of us. On the drive out we stopped in the Mweka Village and Dan gave $15 to Juma to purchase a coke for each of our 21 porters. It was awesome! We got a group photo with all the porters and our guides at that moment as well. A shower back at the hotel felt wonderful! Our entire group. 7 climbers, 21 porters, a guide and three assistant guides. If anyone is considering a trip to Kilimanjaro, feel free to e-mail me if you'd like more information about our trip. Written by Jason Halladay on 15 October 2004.